Introducing Nux Vomica - the Hangover Cure! The homeopathic remedy Nux Vomica is jokingly referred to by Homeopaths as the hangover remedy. Derived from the poison nut or strychnine tree, native to India and South East Asia, Nux Vomica is commonly used to treat digestive problems and symptoms of stress and overwork. A simple case of heartburn from eating rich foods or foods new to the system can be relieved by Nux Vomica. It has a strong action on the digestive system, acting as a cleanser for the liver and digestive tracts. It is very effective for stomach upsets or trouble with constipation. It is often prescribed for children who suffer with chronic constipation. 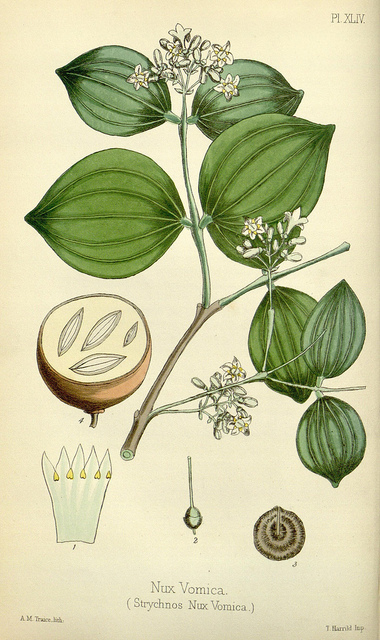 Nux Vomica also has a strong action on the nervous system. For Homeopaths, it is well known as a detox remedy and can prove useful for those giving up cigarettes as it reduces the symptoms of nervous tension while also having a cleansing effect on the whole body. This cleansing-calming effect is why it is so well known for the treatment of hangovers. It can be used where there is a residue of alcohol, coffee or rich food clogging up the system. It is a useful remedy to have about the place after parties and other celebratory times! The occurrence of frequent hangovers combined with a busy lifestyle, working all day and partying after work can be a good indication for a constitutional Nux Vomica prescription, it could be referred to as a workaholics remedy. If you find yourself working long hours and socialising late into the night, keeping yourself going with coffee and cocktails, then this would be a useful remedy to consider where your health is starting to suffer. For example in the treatment of any symptoms associated with stress, anxiety and over work common to high -pressure jobs. Emotionally Nux Vomica is helpful where there are difficulties with sudden outbursts of anger and flying off the handle. Underlying this can be a lot of stress and pressure or maybe some past grief, where there has not been time to absorb and heal it. (Nux Vomica is closely related to Ignatia, a homeopathic remedy commonly prescribed for treating the after effects of grief and shock). Taking a course of homeopathy not only relieves the presenting symptoms but also brings your attention to where you may need to make changes in lifestyle and diet. Homeopathy is a holistic medicine and can help release stress and create space for new ideas and solutions to become apparent. For a constitutional prescription you would need to have a detailed consultation with a homeopath to discuss your particular symptoms and needs. On a first aid basis, Nux Vomica is available in all standard Homeopathic first aid kits for use with hangovers, heartburn and digestive problems: A cleansing tonic for the whole system.